Depressions - 1929 - Fiction. Sierra Nevada (Calif. and Nev.) - Fiction. Hildy Corrigan's world seems about to collapse around her when her unemployed father announces, just before Christmas, 1934, that the family must move away from their Lone River home. The desperate economic times of five straight years of the Great Depression have delivered another harsh blow. Having already moved from state to state, from cabin to tent to barn to tarpaper shack, this move means leaving Ruby and Spud behind as well as her school and new friends. It's just too horrible to face! If only they can find a job for her father in Lone River-. 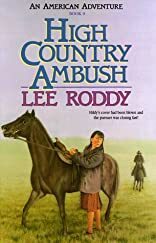 But when Hildy witnesses three men stealing cattle from her friend Ben Strong's ranch, she is drawn into a dangerous encounter with a ruthless escaped convict. Then Ben's favorite horse is missing and he determines to follow the outlaw's trail into a rugged, desolate area in the high Sierra Nevada Mountains. And certainly Hildy, Ruby and Spud cannot leave the old Texas Ranger to track the thief on his own-. Hildy thought she already had enough trouble! Now comes an ambush, a perilous rescue attempt, and an outlaw's fearsome threats!